In 1989, when Odette England was fourteen, her parents were forced to sell her childhood home, a dairy stud farm in Australia, due to falling milk prices. Twenty-two years later, in 2010, England returned to the property with her parents, and gave them color negatives she had previously taken of places on the farm where her parents had photographed her as a child. She asked them to affix the negatives to the soles of their shoes and meander through the homestead. 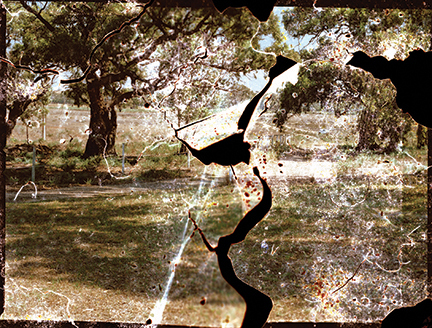 As they walked throughout the farm, the negatives became torn, damaged, and imprinted with dirt and debris. England then took the fragile negatives and printed pictures from them. As she poetically describes, the project is “a movement of reclamation and transcription. Since I cannot work the land with my hands, I work it through the lens, and allow it to work the lens, too, in a sense, through the tread of my parents.” England makes work inflected with the notion of the Australian “walkabout,” in common usage meaning the Aboriginal custom of a man leaving his daily routine and setting off alone and into the wilderness on foot on a spiritual quest. Here, England directs her parents in her own version of the walkabout, where a ritualistic journey provides battered, yet beautiful, physical evidence that suggests a sacred and emotional attachment to place. Odette England completed her MFA at the Rhode Island School of Design (2012) and her PhD from the Australian National University, Canberra (2014). 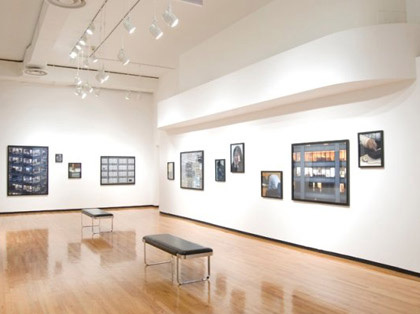 She has participated in exhibitions both nationally and internationally including the George Eastman House International Museum of Photography and Film, Rochester, NY (2014) and the New Mexico Museum of Art, Santa Fe, NM (2012), among many others. She is the recipient of numerous awards, including the Director's Selection, Center for Fine Art Photography (2015); the CENTER Project Launch Award (2012); and the Magenta Foundation Flash Forward Emerging Photographers competition (2009, 2010). England's work is held in the collections of George Eastman House International Museum of Photography & Film, Rochester, NY; New Mexico Museum of Art, Santa Fe, NM; and in numerous private collections.